Gensler’s Portland International Jetport Lands LEED Gold Certification | "Global Possibilities"
The Portland International Jetport expansion in Maine opened in fall 2011, ed but was just awarded LEED Gold certification, patient making it the second commercial terminal in the United States to achieve this status. The 160,000-square-foot, three-gate facility includes a new ticketing hall, a modern baggage handling area that places TSA baggage screening out of view, six new passenger checkpoint lanes, new departures lounges, concessions, and food court seating. Inspired by the natural beauty and resources of Maine, the terminal features timber construction, rarely seen in airport architecture. Natural daylighting, FSC-certified glue laminated structural timbers, and low-maintenance, polished concrete floors add to the sustainability strategies. 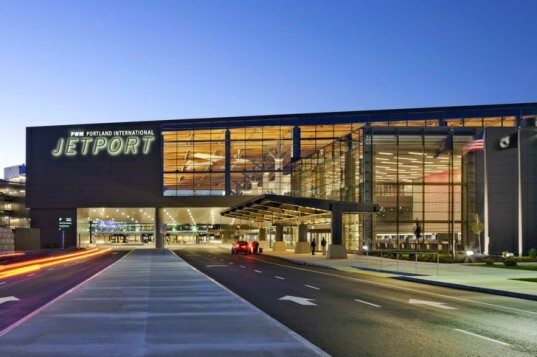 To make the airport more energy efficient, Gensler, with the help of AMEC Earth and Environmental and Haley and Aldrich, designed a dual strategy system that relies on geothermal heating and cooling along with a radiant floor system. The geothermal system was made possible by the first-ever Voluntary Airport Low Emissions (VALE) grant from the Federal Aviation Administration. Installed under the parking lot, the system features 120 wells, each 500 feet deep to serve as a giant thermal battery — rejecting heat in the summer and absorbing heat in the winter. The energy-efficient heating and cooling program will save $200,000 a year on fuel costs and 2 million pounds of CO2 emissions per year, which is the equivalent of taking approximately 180 cars off the road per year.